Here is a quick and easy ab and arm toning workout that pairs arm toning exercises with ab exercises. As a Personal Trainer, I am always trying to help my clients figure out how to get more done in less time. Superset workouts are a great way to increase the efficiency of your workout. In a superset, you simply pair 2 exercises together and alternate between them with little to no rest. This workout can be used by women and men. You can change the emphasis of the workout by changing the weights and repetitions. If you want to focus more on building lean muscle choose a weight that you can lift 8-12 times. This ab and arm workout is divided into 3 supersets. Focus on the first 2 exercises before moving on to the next 2 exercises. Perform the arm toning exercise first and then without any rest perform the ab exercise that is paired with it. Rest 30-60 seconds, and repeat the superset 1-2 additional times before moving on to the next superset. You can click on the picture to get more instructions about the exercise if needed. This is the first superset. Perform bicep curls and then without rest perform bicycle crunches. Begin by standing with your feet facing forward and your palms facing forward. Exhale and bend your elbows, curling the weight up towards your shoulders. Hold briefly at the top and then slowly lower to the starting position. Aim for 8-15 repetitions and then move immediately without rest to bicycle crunches. Lie on your back bring your left knee towards your right elbow, and then switch to the other side. Move in a rhythmic fashion. Rest 30-60 seconds, and then go back to bicep curls. Hold one or two dumbbells in your hands, and bend over so that your body is parallel to the floor. Straighten your arm and hold briefly at the top before slowly lowering to the starting position. Do 8-15 repetitions and then without any rest move on to the plank. The plank is an isometric exercise. This simply means that you hold the same position without moving. Balance on your elbows and toes and hold this position for 30-60 seconds. Keep your back in good alignment. Use your abs to keep your back from sagging or arching too much. Rest after the plank for 30-60 seconds and then go back to triceps kickbacks. Hold dumbbells in your hands with your arms at your sides. Lift your arms out to the side and hold briefly at the top of the movement before returning to the starting position. Keep your neck and shoulder in a good posture throughout. 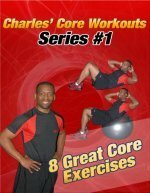 Perform 8-15 repetitions and then without resting move straight to reverse crunches with a ball. If you have a ball, lie on the floor and squeeze the ball against your thighs with your feet. Lift the ball off the floor and bring your knees towards your chest. Hold briefly and return to the starting position. Perform 12-15 repetitions. Rest 30-60 seconds and then go back to the lateral raises. I hope that the instructions for this ab and arm toning workout are clear. Focus on 2 exercises at one time. Aim for 8-15 repetitions for the arm exercises and 15-25 for the ab exercises. Begin with Bicep Curls and Bicycle Crunches. Do 2-3 sets of each exercise before moving on to the next 2 exercises. The second superset is Triceps Kickback and the Plank Pose. And the third superset is lateral raises and reverse crunches. Note: You can use the superset principle to create unlimited workouts. If you have a favorite exercise it is okay to substitute any of the above exercises. Celebrity Doctor Reveals Fat Loss Secret! If your #1 fitness goal is to lose belly fat, try the program and workouts outlined in my ebook Personal Training Secrets to Lose Belly Fat and Get a Flat Stomach. This ebook is more than a list and pictures of the best abdominal exercises. It's a comprehensive fitness and diet solution to get rid of stubborn belly fat. I poured my heart and soul into writing it, and I'm confident that it will deliver results. My ebooks are the most complete source of information on this site, and I back all purchases with an 8 Week Money Back Gaurantee. I will continue to write exclusive programs to help you reach your goals, but I will also continue to write free fitness articles and maintain my site as a fitness resource for you. I hope that I will be able to help you reach your fitness goals. Have fun and Keep Working Hard.